Americans love to fly with their animals. So much so that many US airlines are issuing new guidelines to ensure cabins don’t turn into a Noah’s Ark-like experience. After a child was bitten on a Southwest Airlines flight earlier this year, the low-cost carrier is the latest to state its new rules. The carrier announced yesterday (Aug. 14) it will limit emotional-support animals (ESAs) to one dog or cat per person, with a doctor’s note required. 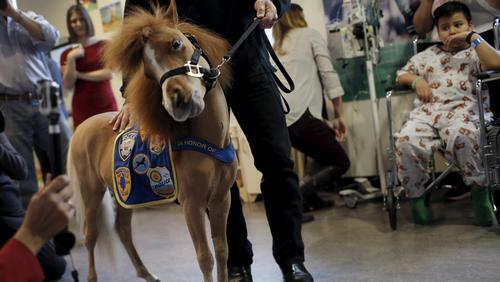 There is, however, a somewhat bewildering caveat: While “unusual or exotic” animals are no longer permitted as trained service animals (which is a separate category from ESAs), miniature horses are still allowed. JetBlue and American do the same. It’s a rule that raises the question: Where do you put a miniature horse on an airplane? (The answer is at your feet). The miniature horses—they couldn’t drag those away. Clarification: This post was updated to make it clearer that emotional support animals are a separate category from trained service animals.